The recent bribe-for-loan scandal involving Bhushan Steel and Syndicate Bank could just be the tip of the iceberg. The systemic rot runs much deeper. Appearances can often be deceptive. A few months ago, all seemed well at Bhushan Steel. Indeed, in May, the steelmaker shifted its corporate office to a palatial building at Bhikaji Cama Place in New Delhi, an upscale commercial destination in the capital. It is a new 12-storey structure within the complex of the luxury hotel Hyatt Regency. But barely four months later, the company found itself at the centre of a storm that has rocked the banking sector. On August 7, the Central Bureau of Investigation (CBI) arrested Bhushan Steel's Vice Chairman and Managing Director Neeraj Singal for allegedly offering a bribe of Rs 50 lakh to Syndicate Bank Chairman and Managing Director Sudhir Kumar Jain for extending its credit limit. Jain had been arrested five days earlier. Significantly, Bhushan Steel is already neck deep in debt and owes around Rs 40,000 crore to 51 banks, including State Bank of India (SBI), Punjab National Bank and others. When Business Today visited the company's corporate office a few days ago, we were told that the senior management had stopped coming to work. A white Jaguar parked outside the main entrance to the lobby was in stark contrast to the nazar battu (a mask-like object supposed to ward off the evil eye) hanging about 15 feet above on the building faÃ§ade. The huge visitors' lobby wore a deserted look. The silence at the corporate office was at odds with the hubbub at Bhushan's factory in Sahibabad Industrial Area, one of its three manufacturing units. Every two minutes, a big iron gate opens up to allow trucks to enter or exit the factory premises. The movement of trucks, mostly carrying scrap, is being supervised by security guards round-the-clock. "The incident is an aberration. The company has not defaulted so far," says a senior employee at the factory. There is a dire need to strengthen the vigilance departments within banks, says CBI director Ranjit Sinha. Meanwhile, the company's lenders have planned to tighten the noose on the steelmaker. A consortium of banks last week decided to appoint three directors on Bhushan's board and conduct a forensic audit of its books, besides asking the company to sell its non-core assets to generate equity. An email seeking an appointment with Bhushan Steel Chairman Brij Bhushan Singal went unanswered. So how can a loss-making, debt-laden company manage to get additional loans? In the past three quarters till June 2014, Bhushan Steel has posted net losses. Its debt-to-equity ratio was 3.47 at the end of 2013/14; in contrast, the average debt-to-equity ratio of top five steel companies is just 1.7. "The Syndicate Bank CMD was extending credit limits to companies like Bhushan Steel even though it was not proper. Such cases appear to be quite rampant. There is a dire need to strengthen the vigilance departments within banks. If we come across more specific instances, we will examine them," says Ranjit Sinha, Director, CBI. The CBI is also probing the role of middlemen in the scam. The involvement of Pawan Bansal, the mastermind in the Syndicate Bank scam and the man behind boutique investment bank firm Altius Finserv, has once again turned the spotlight on debt syndication agencies. Indeed, for a long time, banks have not acknowledged the role of middlemen in manipulating the system. Following the recent incident, PSU banks such as Indian Bank and Andhra Bank have finally acknowledged their murky dealings and come down heavily on them. The Indian Bank has reportedly barred middlemen from entering its offices while Andhra Bank wants the borrower to accompany the middlemen during bank visits. 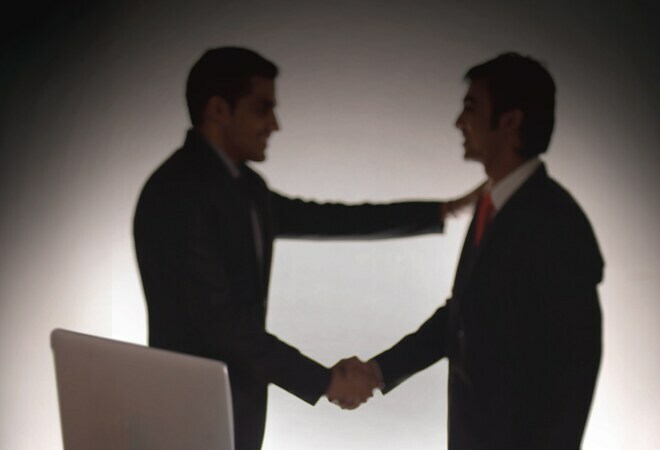 Recently, Reserve Bank of India (RBI) Governor Raghuram Rajan said that "a good middleman acts as a broker. But if the point of a middleman is to pay bribes, that is obviously not okay. Its part of the whole set of governance issues that we need to look at." This is a rare occasion when policymakers and bankers have accepted the presence of middlemen in the system. Last year, the CBI arrested a deputy managing director of SBI for colluding with a former official of the bank to sanction a Rs 400 crore loan to a Delhi-based company. Reportedly, the ex-employee was caught with Rolex and Omega watches, part of the kickbacks for the loan. The [sensationalisation of the Syndicate Bank case] creates a pervasive kind of environment where trust is totally lost, which is not the right thing, says SBI chairperson Arundhati Bhattacharya. Former bank officials are generally employed by loan syndicate companies. Performing investment banking and consultancy functions and much more, these middlemen operate in a highly unorganised space, with no guidelines or RBI rules governing them. Even as the exact number of such companies is not known, observers point out that anyone who has any connections with bankers, secretaries or politicians and some financial background can pass himself off as a loan syndicator. "No licence, qualification or experience is required to set shop. However, chartered accountants, former bankers from PSU and private sector banks and MBAs from low-rung institutes generally make the fit," says a mid-level officer working for a Delhi-based loan syndicate company. All interviews with executives of loan syndicate companies were off the record. In most cases these syndicators scout for businesses looking to raise debt. With a large number of players in the market, the ones with a proven track record and connections to boast of, understandably, bag bigger deals. "The cut-throat competition among loan syndicators not only leads them to undercut their fees but also go to great extents to facilitate loans for clients," confirms another loan syndicator. The promoter signs an 'engagement letter' with the loan syndicate company and pays a management fee, also called success fee, to the syndicator. The fee varies from 0.5 to 5 per cent of the loan amount after the approved loan sanction letter is facilitated by the middleman. Depending on the size of the syndicate company, roles of officials are well defined: some in the team solicit or scout for the business, others are masters at liaisoning with different departments, ministries and agencies. However, in some cases the roles overlap as well. Industry insiders reckon that in three out of four loan approval requests, the services of middlemen are availed of and are especially sought after by companies with a turnover of Rs 500 crore to Rs 2,000 crore. From making plain-vanilla project reports mandated for every loan proposal to preparing intricate Credit Monitoring Analysis (CMA) reports that reflect the financial health of the company, the syndicates work in close association with the bankers to get the necessary approvals. A mid-size promoter explains the dynamics. "The middleman unofficially shows the books to the banker and agrees upon a pre-decided amount for the loan, which the promoter eventually applies for," he says. Loan syndicators point out that the policy framework is such that it leaves a lot of room for maneuverability. For example, portions of balance sheets are selectively highlighted to show the company in sound health while preparing the CMA report. There are a lot of grey areas and plenty is left to subjectivity. There are no RBI guidelines on the essentials of the CMA. Collateral valuations can easily be manipulated even if they are prepared by external agencies. In the techno-economic viability (TEV) report for every new project, costs can be inflated, and loans can be taken against incorrect projections. Inflated project costs work to the advantage of promoters who avoid pumping in their own equity. They are mandated to put in 30 per cent of the cost as equity in order to get 70 per cent debt from the bank. "Most promoters give an impression that they are utilising their share of 30 per cent equity whereas the entire project or operations is run on bank's money," says a middleman. CBI's Sinha also pointed to cases of siphoning off bank loans through over-invoicing of equipments, especially in the power sector. Eventually, a number of such loans turn into NPAs. In lieu of speedy loan sanctioning, especially for over-leveraged companies, the middleman negotiates a percentage of kickback for the bankers. "No deal comes through without an obligation angle or kickback in case of an over-leveraged company," confirms a middleman. "We know where our file is, with which agency, officer and at what level. We accordingly network to move the file." Kickbacks can range from cash, money transfer in foreign accounts via the hawala route to foreign holidays, luxury watches and solitaires. In the case of willful defaulters, the amount of kickback ranges from four to seven per cent of the loan amount as against 0.5-2 per cent in other cases. Depending upon the amount of the loan and the financial condition of the company, the middleman either pays kickback from his own success fee or seeks graft from the businessman. In a perfectly legitimate activity the promoter pays one time finance charges to the syndicate after he facilitates the loan. The cash kickbacks and gifts are shown as business promotion expense in his books. The big cash deals however happen in black. Bankers often can't be blamed for sanctioning more than the due amount to promoters if TEV and CMA reports are manipulated. "These are all technical reports. How is the banker expected to know technicalities? He would go by the report and take a credit call on the basis of the papers presented to him," says a middleman." According to experts, the big problem is when the bankers, in order to show a good record, suggest ways to promoters to white-wash bad loans. "At one end, he has to deploy deposits to generate income. On the other hand, when such cases emerge and the bankers go slow on credit, they are pulled up," says a PSU banker. The practice of paying off debt by taking fresh loans is common among overleveraged companies. 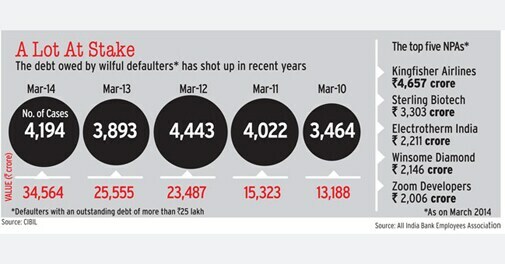 This 'evergreening' of debt is rampant and the RBI governor has already voiced his concern about the practice. "The natural and worst way for a bank management with limited tenure to deal with distress is to 'extend and pretend' to evergreen the loan, hope it recovers by miracle, or that one's successor has to deal with it. The natural incentive for a promoter to deal with distress is to hold on to equity and control despite having no real equity left," Rajan had observed at a banking seminar last November. "Not all bankers and promoters succumb to these natural incentives but too many do," he added. Bank loans are classified as non-performing when the borrower fails on repayments after 90 days. Gross NPAs for the banking sector rose to 3.85 per cent as on March 2014 from 3.26 per cent in the previous year, as per ratings agency Care Ratings. Even as there is no clear consensus on a direct link between corruption in banking and a jump in NPAs, it exposes the vulnerability of the banking system. PSU banks, with a 76 per cent share of lending, contributed 85 per cent to the overall NPAs as on March 2013. 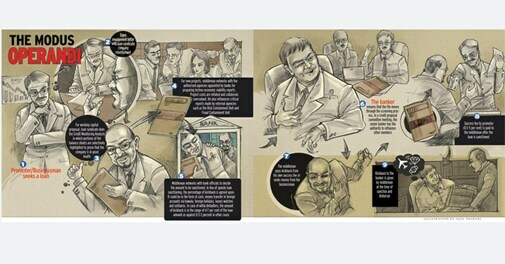 "Ten per cent of NPAs are related to corruption," estimates a partner at a law firm. The government is worried. Finance Minister Arun Jaitley recently said "some recent incidences have been disturbing. I only hope that they are a drop in the ocean". Arundhati Bhattacharya, Chairman, State Bank of India, says bribes-for-loans cases are exceptions. "The [sensationalisation of the Syndicate Bank case] creates a pervasive kind of environment where trust is totally lost, which is not the right thing," she says. Naina Lal Kidwai, Chairman, India and Director, HSBC Asia Pacific, says graft cannot be the prime reason for growing NPAs. "In most cases, it is just used to speed up a proposal rather than getting a loan sanctioned. Most NPAs are on account of slowdown in the infrastructure sector which has been marred by bottlenecks," she asserts. mosimageThere are some who smell a political vendetta in the scandal involving Bhushan Steel. Jain's relative, who was also arrested by the CBI in the bribery case, is a former Congress spokesperson Vineed Godha. "Syndicate Bank is a small bank, one seventh the size of SBI. The CBI should have gone after bigger banks," says a banker on condition of anonymity. The problem, according to experts, began during the 2008 downturn when stimulus packages were announced by the government to revive the economy. The banks began to lend generously resulting in piling up of NPAs and stressed assets. As per a PwC report, the total banking credit outstanding as on March 2013 was Rs 57.90 trillion (one trillion is 100,000 crore) out of which stressed assets (a combination of gross NPAs and restructured assets) are Rs 5.91 trillion - 10.2 per cent of the total credit outstanding. 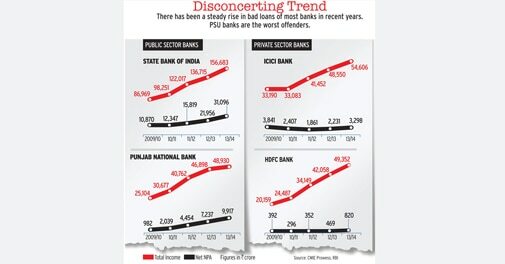 In other words, the rot on the Indian banking sector's books tote up to over 5.5 per cent of the country's GDP. Some companies that have gone through corporate debt restructuring in recent time includes Hotel Leelaventure, Suzlon, HCC, Bharati Shipyard, GTL Group, 3i Infotech and KS Oils. Pankaj Agarwal, Vice President at Ambit Capital, says these stressed accounts can be classified into three categories. "Genuine cases impacted by the economic slowdown, diversion of funds by the promoters to other ventures which have been impacted by the slowdown, and promoters siphoning off the funds for personal use." Analysts say the problem of stressed assets has swelled on account of promoters unable to raise fresh equity through the capital market to pay off their debts. Sources say the government is seriously considering implementing the P.J. Nayak committee report released in May this year. The report has called for an overhaul of state-run banks. It suggests splitting the post of chairman and managing director, and also points out how appointments to the board is a politicised process. The Nayak committee report also picks holes in the law governing the public sector banks. It says that the Bank Nationalisation Act of 1969 is too primitive and irrelevant to cope with the needs of corporate governance. Private sector banks, on the other hand, are governed by the Companies Act, which stipulates stricter norms. Senior banker Rana Kapoor, President of industry body Assocham, agrees that solutions to the current problems lie in strengthening the corporate governance structure. "Right now, the CMD takes care of both policy and implementation aspects. A single person should not become a power centre." Private sector banks such as ICICI Bank and HDFC Bank have separate chairman and managing director positions. At ICICI Bank, for instance, K.V. Kamath is the non-executive chairman and Chanda Kochhar is MD & CEO. Even as some feel the splitting up of roles is a step in the right direction, it can only work well if the chairmen are not political appointees. "If the appointments are politicised it will not solve any purpose. The chairmen's post has to be in good hands. In private sector banks, chairman, MD and CEO are different with well defined roles," says Krishnamurthy Subramanian, Assistant Professor at the Indian School of Business and a member of the Nayak committee. "Also, there are independent board directors. A lot of governance and processes comes through the board. If the board is not strong there is temptation to indulge in such practices." Banks are now also using the services of outside consultants to restructure loans. SBI, for instance had engaged the services of Alvarez & Marsal. "It's a relatively new trend and Indian banks have been benefiting from it," says Nikhil Shah, MD, Alvarez & Marsal. To minimise the risk for the banking sector, the central bank has also proposed to cut the exposure limits of banks to a group of borrowers from the present 40 per cent to 25 per cent of a bank's capital. The RBI has also set up a credit central repository for information on large borrowers of banks. However, a lot also will depend on the macroeconomic outlook as well. If the Indian economy revives, the business environment improves and the stock markets rally, it could come as a shot in the arm for indebted corporates. Meanwhile, even as the government and the RBI plan to implement the Nayak committee's recommendations, businessmen are already sceptical about the move. A Delhi-based businessman says this move will only slow down the approval process and make securing of the loans costlier. "Now we will have to grease more hands. This certainly will not end graft."